For the second time in as many weeks, Blue Bell Creameries has issued a product recall for additional single-serving products. The products recalled are the single-serving cups (3 FL. Oz.) of chocolate, strawberry and vanilla. These cups are sold to the educational and other institutional markets and are not sold in retail outlets. The Kansas Department of Health and Environment reported that one chocolate cup, out of nineteen that were tested, came back with a positive response to Listeria, said Blue Bell spokesman Joe Robertson in an interview with Breitbart Texas. In an overabundance of caution, Blue Bell recalled all three flavors of the institutional/food service cups. Robertson said the products were made at a Blue Bell owned facility in Broken Arrow, Oklahoma. The machine that manufactured these products has been shut down for evaluation. “We have not yet determined the cause or what we will do with this machine,” he said. The products were manufactured on April 15, 2014. They are not sold in retail outlets, including convenience stores and supermarkets. No one has been reported ill from these products, Blue Bell said in a press release obtained by Breitbart Texas. Earlier this month, Blue Bell issued the first recall of products in its 108 year history. Those products also tested positive for Listeria in Kansas. No other states have reported problems with any Blue Bell products, Robertson said. The initial recall was issued after three people died after eating some of the products that were manufactured on a single machine in Brenham, Texas. That machine and those products have been permanently discontinued. Robertson reiterated these recalls do not involve any of the retail products that are sold in grocery and convenience stores. 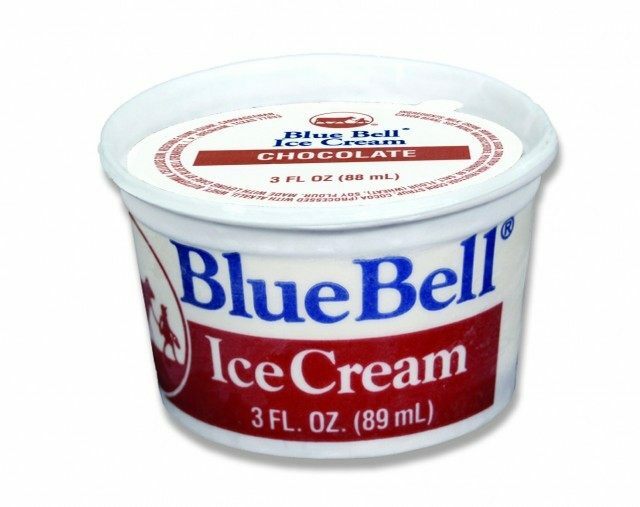 This recall in no way includes Blue Bell Ice Cream half gallons, pints, quarts, 3 gallons or other 3 oz. cups, according to the press release.